A client has asked whether I can insert a spreadsheet that calculates a monthly payment based on numbers that would be entered by the user. Users have to enter 8 values. I uploaded the spreadsheet to Google, made it public, and inserted it as a web object, published and it comes out as a static document. Does anyone know of a way to upload this so learners can edit it? Can I create something like this using variables? Storyline is very powerful and you can use variables and triggers to calculate monthly and yearly payments based on entries by the user. I have attached a calculator that was done for a client of mine. It will give you a good idea of what you can do and hopefully save you some time when building yours. In that example, each cell in the table can be clicked on (or tabbed to) and edited. 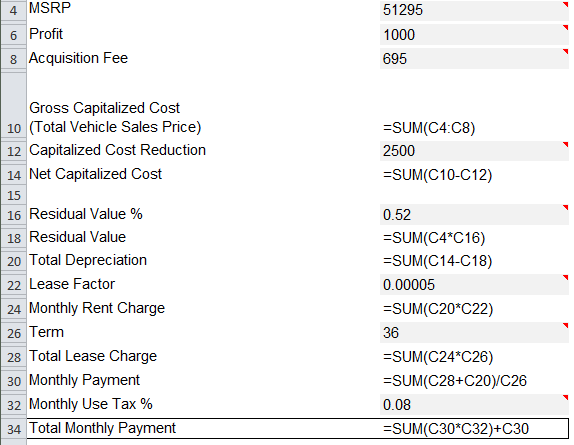 When the user selects various rows using the checkboxes and clicks the Update button, the sum and average of the columns is calculated. Each cell in the table is monitored by a unique variable defined for that cell. This example isn't a payment calculator of course but the principles are the same. I believe there are a few simple payment calculator examples floating around here in the forums. Thanks...I was wondering whether I could build it right in Storyline. Dustin...I got a 404 error when I clicked on the link you posted. Any chance you can repost it? Thanks Steve...not sure if I know how I'm going to do this, but I am happy that it looks possible! @Dustin...got it to work in IE. My Google Chrome is acting up! Thanks! Hi Jill! Looks like Dustin and Steve are taking care of you here, so let us know if you need anything further. Jill, glad you were able to grab it. I was going to upload a zip version of it for you, however, I was also getting an error. Firefox, seemed to work and would also let me download. Let me know if you need anything else. Set it to "Anyone with a link" and change permission to "Edit". Thanks Seth! That is definitely progress...but now that I see it, I need a more custom look. I don't want to show the entire spreadsheet...I just want to show the calculation area and cut out the rest....but duh...that isn't how web objects work - they show the entire page. Still searching for a solution...I like Dustin's idea, but I am concerned that the programming may get too complex, and the full functionality of the spreadsheet will not be there. Still open to ideas and thanks to all for the input! I like the look of the first one the best. Thanks in advance for any ideas! Hi Phil...I have the spreadsheet with all the formulas in it. Take a look at this; slightly involved but not too complicated. p.s: I assume you are aware of the characteristics of a shared GoogleDoc document; it'll get auto saved every time someone types in something. Oh, I didn't see that you'd already posted. Now that I know what you're after, it's really easy to build it in SL. Like Phil said, it shouldn't take very long. Easy for you guys to say! I have worked with variables - but mostly true/false and single instances of numeric and text variables. I am not sure how to create a variable that performs multiple calculations...e.g. add the values from lines 3 through 8 and divide by the value in line 9. Gulp! Here is an image of the spreadsheet with the formulas revealed. Lines 30 and 34 are the ones that worry me. How would you program these? Also, I want to be able to reset it...or make it so that any change in the calculations will automatically update the bottom line. I would prefer that a user would not have to restart the entire calculation if they only want to change one number. Any ideas on this would be soooo welcome! I still think this can work, would you being willing to upload a working copy of the spreadsheet? I am happy to have a crack at it. I too am looking to build a simple payment calculator, however using sliders. One slider would need to be used to select a total dollar amount - which would increase in increments of $100. Then a second slider to select the number of payments (6, 12, 24, 36, 48, 60). Using the combination of both sliders, the total dollar amount would be divided by the number of payments, and displayed in a separate area on the slide. Attached is a very basic Storyline 2 file that illustrates what you're trying to achieve. Let me know if you have any questions. Oh Steve, you are awesome! Thank you everyone for your advice and assistance! I know this is an old thread, but this is exactly what I'm looking for, is there any breakdown of how this was created? It is a bit dated Candace, but it looks like you have some .story files to peel apart if you wish. Hopefully Steve is still subscribed here, but if you do not hear back soon you are certainly welcome to reach out to the user directly via the 'Contact Me' option on the user profile. "Hi Cory, Attached is a very basic Storyline 2 file that illustrate..."